Application Milk,Curd Milk,Paneer Milk,Ice Cream Mix,Juice,Honey etc. Zeutech Pasteurizer is an efficient, advanced and sophisticated machine to pasteurize the raw milk or other products, making into harmful pathogenic bacteria-free with reduced enzymatic activity and without damaging the product that is suitable for human consumption. Thus it increases the shelf-life of the products resulting in production, distribution and consumption in much greater scale with convenience. 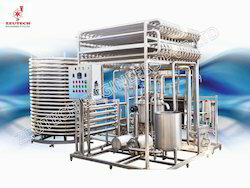 Every aspect of our pasteurizer like temperature program, flow control etc. are taken in greatest care to provide the users optimum benefits like product safety, finest product quality, low operational running cost, minimum human intervention, error free operation, environmental savings etc. What stand out in case of Zeutech Pasteurizers are: high levels of safety and hygiene, superior process control, reliable and efficient heat treatment, durable and sturdy construction, flawless design unmatched after-sales service etc., all these in a very affordable pricing. Pasteurizing multiple products like milk, curd milk, paneer milk etc. 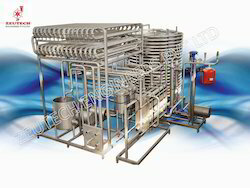 in a single Pasteurizer is the highlight of our innovative and highly efficient product, the Multipurpose Pasteurizer. 100% customization in terms of capacity, size etc. and incorporating world's best plates make the Multipurpose Pasteurizer as most sought-after equipment for small to mid-scale dairy operations in India and abroad.